For about a week, Tamatoa, our newest PP, has been unmoving in the corner of the habitat between the coconut hut, and some fiber used as a climbing ladder. It's a dark, cooler part of the terrarium. Since he was hunkered down, I figured he was destressing, and did not want to bother him. For the last two days, I noticed he had moved position, with the opening of his shell being against the coconut hut, as if to keep anyone from getting to him. I was concerned and picked him up. There was no resistance as he was not holding on to the hut, just leaning against it. When I observed him I saw that his big claw was missing. I found it close to where he had been located in the terrarium. I put him back where he was. I am not sure if the limb fell off from stress, or if this may have been from a fight. Bob (our first PP) and Tamatoa did not appear to like each other at first when he was introduced, but after some time they appeared to tolerate each other. Bob is roughly the same size as Tamatoa. What do you think may have occurred, and how can I help Tamatoa? 2. Do you have gauges in the tank to measure temperature and humidity? If so, where are they located and what temperature and humidity do they usually read? Analog gauges roughly an inch above the substrate against the glass. Humidity ranges from >75% to <95%. Temperature ranges from roughly 78 - 82. 3. Is a heat source used in the tank? If so, what? Two. Heat lamps and a UTH. UTH is a store bot mini heater (Ultratherm should be in this week). To compensate, daylight and nightlight heating bulbs (25W) are used. from 7AM to 6PM is the daylight bulb, rest is nightlight. 5. What kinds of food do you feed and how often is it replaced? Eggshells and egg bits, dried fruit, and carrots. Transitioning away from store bought (all living things) hermit crab food that they were previously eating. Changed each morning. 6. How long have you had the crab and what species is it, if known? PP has only been with us for a month. Noticed agressive behavior between Bob (our first crab) and Tamatoa (missing claw). 7. 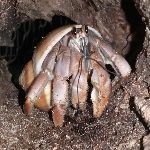 Has your crab molted, and how long ago did it happen? Has not occurred with us yet, but the crab is not burrowing either, as others have normally done. 8. What type of housing are the crabs kept in, what size is it and what kind of lid is on the housing? Temporarily housed in a 12x12x24 terrarium while the replacement is being put together. An accident caused a crack in the old terrarium. Screen cover. 9. How many crabs are in the tank and about how large are they? 3 crabs of small to medium size. Again, only housed in smaller tank due to damaged old tank. 10. How many extra shells are usually kept in the tank, if any? Due to size restrictions, 3 in current tank. New tank has 9, not including those three. 11. Have there been any fumes or chemicals near the crabitat recently? Wife sprayed scented air freshener in the room, with close proximity. Asked that she avoid that in the future, and cover them first if she does. 12. How often do you clean the tank and how? Spot cleaning daily, all items removed form the surface ever few days (3-4) to remove any waste from the surface. 14. Has anything new been added to your crabitat recently? No. Substrate should be 6 inches or 3 times the height of your largest crab (whichever is deeper). It should also be mixed with dechlorinated marine saltwater or dechlorinated freshwater to make the substrate sandcastle consistency. I don't recommend distilled water. Hermit crabs need minerals from tap water. If you have a salt dechlorinator combo I'm going to take a guess and think that it is for hermit crabs. Unfortunately most products marketed for hermit crabs are not safe. You need a dechlorinator that removes chlorine, and chloramine as well as neutralizes ammonia and heavy metals. A lot of us use a product called Prime. As far as salt, you need marine salt, to mimic the ocean. A lot of us use a product called Instant Ocean which is what aquarium hobbyists use to make saltwater aquariums. It has the essential trace elements that hermit crabs need. You have to use the dechlorinator for both freshwater and marine saltwater. Both pools should be deep enough for them to fully submerge in and safe enough for them to get out of. Sponges are an old practice. Toss them. Also, crabs should be given pools deep enough for them to fully submerge in on their own, and safely get out of. A lot of us use Tupperware container like Glad/Ziploc and line them with craft mesh or aquarium décor. They need a freshwater and marine saltwater pool. Edit: More than likely what is going on is due to PPS (Post Purchase Syndrome) Nothing to do with you. Hermits are taken from the wild, and then they go through a lot before they find homes. Leave the hermit alone, and just do your best to make conditions right for him/her. Hopefully he can pull through. Once again - be hands off - just leave him/her alone - that is the only thing you can do at this point. Good luck. I will look into the dechlorinator and treatment products you mentioned and see what I can find locally, if not i'll have to hunt on Amazon. The distilled water will still be used, but only for their fogger, not for their pools. Hard water / tap water will cause problems for the fogger. So this is just a stress thing. I will do my best to leave Tamatoa be. I did want to add in to make sure you give them protein - bits of meat (raw or cooked plain), dried insects, and even things like shrimp or krill work great! The latter on the list can be found in the reptile or fish isles at pet stores or online. Just make sure you check the ingredients and make sure they don't contain a lot of additives - big ones to avoid are copper sulfate and ethoxyquin. Tamatoa did not make it. They have new water dishes that they can fully submerge in, using Prime and Instant Ocean to condition the water. Their diet has changed to fresh food, this week being chicken, carrots, and oranges. There are other changes that have been made as well, detailed in the topic linked above.